As Paul Manafort faces yet more legal troubles after it was reported yesterday that he has lied to investigators, breaking the terms of a plea agreement, a new report from The Guardian indicates that he had closer ties to Julian Assange than originally thought. According to The Guardian the former Trump campaign manager paid three separate secret visits to Julian Assange in the Ecuadorian embassy in London. The visits reportedly took place in 2013, 2015 and around March of 2016, around the same time that Manafort took a job as campaign adviser for candidate Trump. The timing of the final visit has almost certainly garnered the attention of special counsel Robert Mueller who has been tasked with investigating ties between the Trump campaign and Russia. The March 2016 date is key because, not only did this come around the time that Manafort was brought on to the campaign as an adviser, but it preceded the release by Assange and Wikileaks of thousands of Democratic emails stolen by Russian intelligence officers, which took place in the months to follow. The Guardian has also gotten ahold of an internal document written by Ecuador’s Senain intelligence agency, which clearly lists Paul Manafort and “Russians” as well-known guests of Mr. Assange. Usually visitors to the embassy are logged. However, in this case Manafort never did sign in and proceeded to meet with Assange for approximately 40 minutes, according to reports. It wasn’t until later that the significance of this visit opened the eyes of those working within the embassy. When one steps back and looks at the bigger picture, a picture which includes Assange’s meeting with Russians at the embassy, Trump adviser Roger Stone, and Donald Trump Jr’s communications with Assange, and the fact that Manafort met three times with Assange, quite a clear picture of possible collusion to release emails that summer quickly develops. 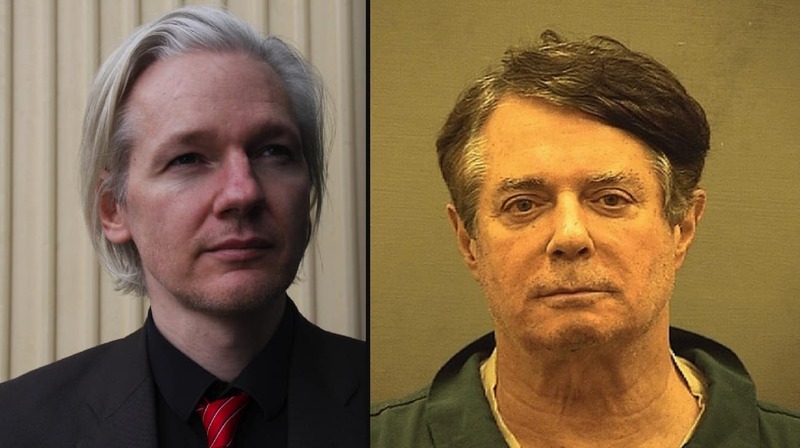 With hints that both Assange and Stone are, or will soon be the subjects of indictments, and Manafort breaking his recent plea deal by lying, the big picture appears to further develop for investigators.